• Molly Haskell and Robert Polito - in this filmed conversation, critics Molly Haskell and Robert Polito discuss the original novel by James M. Cain that inspired Mildred Pierce, the noir/other qualities of the film and versatility of the character played by Joan Crawford, Michael Curtiz's direction, etc. The conversation was recorded exclusively for Criterion in 2016. In English, not subtitled. (24 min, 1080p). • Joan Crawford: The Ultimate Movie Star - this archival documentary produced by Peter Fitzgerald examines the life and career of Joan Crawford. It is narrated by Anjelica Huston, and includes interviews with the star's biographer Bob Thomas, actors Diane Baker, Betsy Palmer, Cliff Robertson and Anna Lee, columnist Liz Smith, and playwright/Crawford historian Charles Busch, amongst others. The documentary was produced in 2002. In English, not subtitled. (88 min, 1080i). 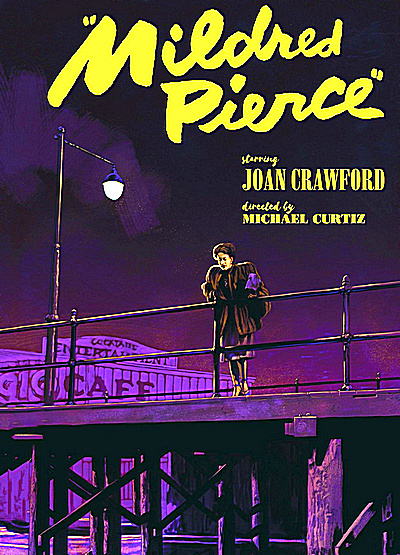 • David Frost and Joan Crawford - presented here is an archival excerpt from The David Frost Show in which Joan Crawford discusses her contribution to Mildred Pierce and work with director Michael Curtiz. The episode was broadcast on January 8, 1970. In English, not subtitled. (16 min, 1080i). • Ann Blyth - presented here is an archival Q&A session with actress Ann Blyth (Veda Pierce) which was filmed after a screening of Mildred Pierce at the Castro Theatre in San Francisco in 2006. The session is presented and moderated by film noir expert Eddie Muller. In English, not subtitled. (24 min, 1080i). • James M. Cain - presented here is an archival interview with author James. M. Cain conducted by Hugh Downs for the Today show. The two gentlemen discuss the role of violence in American literature and culture, the relationship between TV and violence, and the Cain's decision to leave Hollywood and return to Maryland. The interview was conducted on November 26, 1969. In English, not subtitled. (11 min, 1080p). • Trailer - original trailer for Mildred Pierce. In English, not subtitled. (3 min, 1080p).